A recent study has demonstrated that a turning-based treadmill program yields greater improvements in gait speed and temporal symmetry than regular treadmill training in chronic stroke patients. However, it remains unknown how this novel and challenging gait training shapes the cortico-cortical network and cortico-spinal network during walking in chronic stroke patients. The purpose of this study was to examine how a novel type of gait training, which is an unfamiliar but effective task for people with chronic stroke, enhances brain reorganization. Subjects in the experimental and control groups received 30 min of turning-based treadmill training and regular treadmill training, respectively. Cortico-cortical connectivity and cortico-muscular connectivity during walking and gait performance were assessed before and after completing the 12-session training. Eighteen subjects (n = 9 per group) with a mean age of 52.5 ± 9.7 years and an overground walking speed of 0.61 ± 0.26 m/s consented and participated in this study. There were significant group by time interactions for gait speed, temporal gait symmetry, and cortico-cortical connectivity as well as cortico-muscular connectivity in walk-related frequency (24–40 Hz) over the frontal-central-parietal areas. Compared with the regular treadmill training, the turning-based treadmill training resulted in greater improvements in these measures. Moreover, the increases in cortico-cortical connectivity and cortico-muscular connectivity while walking were associated with improvements in temporal gait symmetry. Our findings suggest this novel turning-based treadmill training is effective for enhancing brain functional reorganization underlying cortico-cortical and corticomuscular mechanisms and thus may result in gait improvement in people with chronic stroke. A recent study suggested that chronic stroke patients maintain the capacity to increase synchronization of neural activity between different brain regions as measured by EEG connectivity. These changes of functional connectivity in the motor cortex through neurofeedback correlate with improvements in motor performance . Previously, we demonstrated that a novel specific training, the turning-based treadmill program, yielded greater improvements in gait speed and temporal symmetry than regular treadmill training for people with chronic stroke . We presumed the turning-based treadmill training, which is a challenging and unfamiliar training task for chronic stroke patients, may facilitate brain reorganization and behavioral recovery . Thus, we sought to understand how such novel gait training promotes brain reorganization in this study. More than 80% of stroke survivors worldwide suffer from permanent upper limb motor deficits. Restoration of upper limb motor functions in conventional rehabilitation remains challenging; the main difficulties are as follows: 1) lack of intensive, repetitive practice in manually delivered treatment; 2) lack of coordination management of upper limb motor tasks, particularly those involving the distal joints, e.g., the wrist and the hand; and 3) lack of understanding of the optimal joint supportive scheme in task-oriented upper limb training. More effective training strategies are necessary for upper limb rehabilitation following stroke. Robots have proved to be valuable assistants in labour-demanding post-stroke rehabilitation, with a controllable mechanical design and repeatable dynamic support in physical training. A series of rehabilitation robots for multi-joint practices were successfully designed in our previous works. In this work, we proposed a device-assisted multi-joint coordinated strategy for post-stroke upper limb training. The objectives of the study were as follows: 1) To evaluate the rehabilitation effectiveness of multi-joint coordinated upper limb practice assisted by an electromyography (EMG)-driven neuromuscular electric stimulation (NMES)-robot for stroke survivors in both the subacute and chronic stages. 2) To compare different joint supportive schemes using NMES-robots and identify the optimized scheme for upper limb rehabilitation. The objectives were achieved through three independent clinical trials using common clinical assessments, namely, the Fugl-Meyer Assessment (FMA), Modified Ashworth Scales (MAS), Action Research Arm Test (ARAT), and Functional Independence Measurement (FIM), and cross-session EMG evaluations to trace the recovery progress of individual muscle activities (i.e. EMG activation level) and muscular coordination (i.e. Co-contraction Index, CI) between a pair of muscles. The first clinical randomized controlled trial (RCT) was conducted to investigate the clinical effects and rehabilitation effectiveness of the new training strategy in the subacute stroke period. Subjects were randomly assigned to two groups and received either 20 sessions of NMES-robot-assisted training (NMES-robot group, n=14) or time-matched conventional treatments (control group, n=10). Significant improvements were achieved in FMA (full score and shoulder/elbow), ARAT, and FIM for both groups [P<0.001, effect sizes (EFs)>0.279], whereas significant improvements in FMA (wrist/hand) and MAS (wrist) after treatment were only observed in the NMES-robot group (P<0.05, EFs>0.145), with the outcomes maintained for 3 months. In the NMES-robot group, CIs of the muscle pairs of biceps brachii and flexor carpi radialis (BIC&FCR) and biceps brachii and triceps brachii (BIC&TRI) were significantly reduced and the EMG activation level of the FCR decreased significantly. 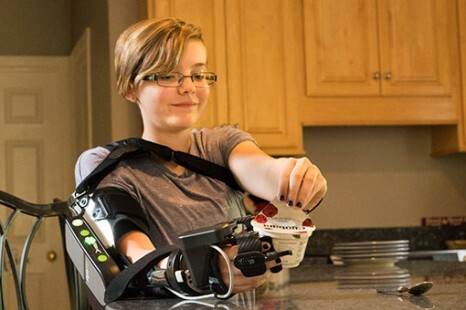 The result indicated comparable proximal motor improvements in both groups and better distal motor outcomes and more effective release of muscle spasticity across the whole upper limb in the NMES-robot group. The second part of the work was a clinical trial with a single-group design. Recruited chronic stroke patients (n=17) received 20 sessions of NMES-robot-assisted multi-joint coordinated upper limb training. Significant improvements were observed in FMA (full score and shoulder/elbow), ARAT, and FIM (P<0.05, EFs>0.157) and maintained for 3 months. CIs of the FCR&TRI and BIC&TRI muscle pairs and EMG activation levels of the FCR and BIC significantly decreased. The results indicated that the new training strategy was effective for upper limb recovery in the chronic stroke, with the long sustainability of the motor outcomes. In the third trial, another clinical RCT was conducted to investigate the training effects of different joint supportive schemes. The recruited chronic subjects were randomly assigned to receive task-oriented multi-joint practices with NMES-robotic support either to the finger-palm (hand group, n=15) or to the wrist-elbow (sleeve group, n=15). Significant improvements in FMA (full score and shoulder/elbow) and ARAT (P<0.05, EFs>0.147) were observed in both groups, whereas significant improvements in FMA (wrist/hand) and MAS (finger, wrist, and elbow) (P<0.05, EFs>0.149) were only observed in the hand group. These results indicated that the distal supportive scheme was more effective in distal motor recovery and whole arm spasticity control than the proximal supportive one under the same training strategy. In conclusion, NME-robot-assisted multi-joint coordinated training was able to achieve significant motor outcomes and effective muscle spasticity control in the entire upper limb, especially at the distal segments, i.e., the wrist and the fingers, in both subacute and chronic stroke patients. Moreover, the distal supportive scheme proved more effective than the proximal supportive scheme in multi-joint coordinated upper limb training. Rehabilitation is important treatment for post stroke patient to regain their muscle strength and motor coordination as well as to retrain their nervous system. Electromyography (EMG) has been used by researcher to enhance conventional rehabilitation method as a tool to monitor muscle electrical activity however EMG signal is very stochastic in nature and contains some noise. Special technique is yet to be researched in processing EMG signal to make it useful and effective both to researcher and to patient in general. Feature extraction is among the signal processing technique involved and the best method for specific EMG study needs to be applied. In this works, nine feature extractions techniques are applied to EMG signals recorder from subjects performing upper limb rehabilitation activity based on suggested movement sequence pattern. Three healthy subjects perform the experiment with three trials each and EMG data were recorded from their bicep and deltoid muscle. The applied features for every trials of each subject were analyzed statistically using student T-Test their significant of p-value. The results were then totaled up and compared between the nine features applied and Auto Regressive coefficient (AR) present the best result and consistent with each subjects’ data. This feature will be used later in our future research work of Upper-limb Virtual Reality Rehabilitation. A neuromuscular interface (NI) that can be employed to operate external robotic devices (RD), including commercial ones, was proposed. Multichannel electromyographic (EMG) signal is used in the control loop. Control signal can also be supplemented with electroencephalography (EEG), limb kinematics, or other modalities. The multiple electrode approach takes advantage of the massive resources of the human brain for solving nontrivial tasks, such as movement coordination. Multilayer artificial neural network was used for feature classification and further to provide command and/or proportional control of three robotic devices. The possibility of using biofeedback can compensate for control errors and implement a fundamentally important feature that has previously limited the development of intelligent exoskeletons, prostheses, and other medical devices. The control system can be integrated with wearable electronics. Examples of technical devices under control of the neuromuscular interface (NI) are presented. Development of neurointerface technology is a topical scientific focus, with the demand for such systems driven by the need for humans to communicate with numerous electronic computing and robotic devices (RD), for example, in medical applications such as prosthetic limbs and exoskeletons. At present, multichannel recording of neuromuscular activity and the development of neurointerface applications that implement unique mechanisms for high-dimensional data processing are areas of major interest. One of the most suitable signals aiming at controlling external RDs is electromyographic (EMG) activity. Multichannel signals from the human peripheral nervous system have been previously successfully used to control external devices and novel methods of EMG acquisition and control strategies have recently been implemented [1–8]. When controlling anthropomorphic RD, the human pilot independently coordinates and plans the trajectory of motion using the massive computing power of the human brain [9, 10]. The use of afferent neural pathways allows the activation of biological feedback; using this principle is fundamentally important to the development of rehabilitation exoskeletons, prostheses, and various other medical applications. The disadvantages of using EMG interfaces in rehabilitation are the presence of muscle fatigue and insufficient residual muscle activity. On the other hand electroencephalographic (EEG) interfaces proved to be the best due to a direct link to the nervous system by measurement of brain activity during therapy [11, 12]. The brain mechanisms that enable humans to facilitate the control of external devices remain largely unknown. However, despite this knowledge gap, appropriate collection, detection, and classification can enable brain-controlled signals from the human body to be utilized for highly efficient and even intelligent control of multiparameter RDs. But brain-machine interfaces (BMI) have some limitations such as low reliability and accuracy when it comes to complex functional task training. A possible solution to these problems is the combined use of the advantages of both types of interfaces. Such interfaces are called hybrid, for example, hybrid BMI (hBMI); the use of EMG input here can lead to a more accurate classification of EEG patterns [13–15]. However, the task of developing an EMG interface is still relevant. Considering the problem of motion recognition and decoding of EMG signals, note that there are several generally applicable methods of software signal processing: linear discriminant analysis (LDA) , support vector machines (SVM) , artificial neural networks (ANN) , fuzzy algorithms [22, 23], etc. Despite significant progress in the field of machine learning and its application in medical tasks , algorithms are still based on applying ANN technologies and solving optimization problems. Creation of a universal algorithm that can adapt to different conditions in a technical control system was proven theoretically impossible, at least in the context of existing theories [25, 26]. Compared to traditionally controlled electronic devices, neurocontrolled devices may offer the advantage of adapting due to human brain plasticity. The peripheral sensory system is critical to regulating motor plasticity and motor recovery. Peripheral electrical stimulation (ES) can generate constant and adequate sensory input to influence the excitability of the motor cortex. The aim of this proof of concept study was to assess whether ES prior to each hand function training session for eight weeks can better improve neuromuscular control and hand function in chronic stroke individuals and change electroencephalography-electromyography (EEG-EMG) coherence, as compared to the control (sham ES). We recruited twelve subjects and randomly assigned them into ES and control groups. Both groups received 20-minute hand function training twice a week, and the ES group received 40-minute ES on the median nerve of the affected side before each training session. The control group received sham ES. EEG, EMG and Fugl-Meyer Assessment (FMA) were collected at four different time points. The corticomuscular coherence (CMC) in the ES group at fourth weeks was significantly higher (p = 0.004) as compared to the control group. The notable increment of FMA at eight weeks and follow-up was found only in the ES group. The eight-week rehabilitation program that implemented peripheral ES sessions prior to function training has a potential to improve neuromuscular control and hand function in chronic stroke individuals. Stroke is one of the leading contributing factors to the loss of functional abilities and independence in daily life in adults1. The most common and widely observed impairment following stroke is motor impairment, which can be regarded as a loss or limitation of function in muscle control or movement2,3,4,5. Most stroke survivors later regain the ability to walk independently, but only fewer than 50% of them will have fully recovered upper extremity functions6,7. From a review focusing on motor recovery after stroke, it has been indicated that the recovery of both arm and hand function among subacute and chronic stroke survivors is limited in current neural rehabilitation settings4; therefore, additional management with activating plasticity before or during performing motor training is necessary for better motor recovery. The fundamental principle of stroke rehabilitation is inducing brain plasticity by sensory or proprioceptive input in order to facilitate motor functions8,9. It has been demonstrated that strong sensory input can induce plastic changes in the motor cortex via direct or indirect pathways10,11,12,13,14,15,16,17. In this case, electrical stimulation (ES) that provides steady and adequate somatosensory input can be an ideal method of stimulating the motor cortex. Recent studies using functional magnetic resonance imaging (fMRI) or transcranial magnetic stimulation (TMS) suggest that ES on peripheral nerves can increase motor-evoked potential (MEP)18,19,20, increase the active voxel count in the corresponding motor cortex13, and increase blood-oxygen-level dependent (BOLD) signals in fMRI, suggesting peripheral ES induced higher excitability and activation level of cortical neurons21. Since the expansion of the motor cortical area or increase in the excitability of neural circuits is associated with learning new motor skills22,23,24,25,26, clinicians should take advantage and assist patients with stroke on motor tasks training during this period of time. Celnik and colleagues27 found that the hand function of chronic stroke subjects improved immediately after two-hour peripheral nerve stimulation combined with functional training, and the effect lasted for one day. Based on previous studies, the ES that increases corticomuscular excitability may turn out to be an ideal intervention added prior to traditional motor training to “activate” the neural circuit, so that patients may get the most out of the training. According to a recent study that applied single session peripheral ES on post-stroke individuals, the corticomuscular coherence (CMC), which is the synchronization level between EEG and EMG, increased significantly and was accompanied by improvement in the steadiness of force output28. At USC, Dr. Sook-Lei Liew is testing whether watching a virtual avatar that moves in response to brain commands can activate portions of the brain damaged by stroke. I am hooked up to a 16-channel brain machine interface with 12 channels of EEG on my head and ears and four channels of electromyography (EMG) on my arms. An Oculus Rift occludes my vision. Two inertial measurement units (IMU) are stuck to my wrists and forearms, tracking the orientation of my arms, while the EMG monitors my electrical impulses and peripheral nerve activity. Dr. Sook-Lei Liew, Director of USC’s Neural Plasticity and Neurorehabilitation Laboratory, and Julia Anglin, Research Lab Supervisor and Technician, wait to record my baseline activity and observe a monitor with a representation of my real arm and a virtual limb. I see the same image from inside the Rift. I stay still, close my eyes, and let my mind go blank. Anglin records my baseline activity, allowing the brain-machine interface to take signals from the EEG and EMG, alongside the IMU, and use that data to inform an algorithm that drives the virtual avatar hand. “Now just think about moving your arm to the avatar’s position,” says Dr. Liew. I don’t move a muscle, but think about movement while looking at the two arms on the screen. Suddenly, my virtual arm moves toward the avatar appendage inside the VR world. Something happened just because I thought about it! I’ve read tons of data on how this works, even seen other people do it, especially inside gaming environments, but it’s something else to experience it for yourself. “Very weird isn’t it?” says David Karchem, one of Dr. Liew’s trial patients. Karchem suffered a stroke while driving his car eight years ago, and has shown remarkable recovery using her system. “My stroke came out of the blue and it was terrifying, because I suddenly couldn’t function. I managed to get my car through an intersection and call the paramedics. I don’t know how,” Karchem says. He gets around with a walking stick today, and has relatively normal function on the right side of his body. However, his left side is clearly damaged from the stroke. While talking, he unwraps surgical bandages and a splint from his left hand, crooked into his chest, to show Dr. Liew the progress since his last VR session. As a former software engineer, Karchem isn’t fazed by using advanced technology to aid the clinical process. “I quickly learned, in fact, that the more intellectual and physical stimulation you get, the faster you can recover, as the brain starts to fire. I’m something of a lab rat now and I love it,” he says. Karchem is participating in Dr. Liew’s REINVENT (Rehabilitation Environment using the Integration of Neuromuscular-based Virtual Enhancements for Neural Training) project, funded by the American Heart Association, under a National Innovative Research Grant. It’s designed to help patients who have suffered strokes reconnect their brains to their bodies. “My PhD in Occupational Science, with a concentration in Cognitive Neuroscience, focused on how experience changes brain networks,” explains Dr. Liew. “I continued this work as a Postdoctoral Fellow at the National Institute of Neurological Disorders and Stroke at the National Institutes of Health, before joining USC, in my current role, in 2015. “Our main goal here is to enhance neural plasticity or neural recovery in individuals using noninvasive brain stimulation, brain-computer interfaces and novel learning paradigms to improve patients’ quality of life and engagement in meaningful activities,” she says. Here’s the science bit: the human putative mirror neuron system (MNS) is a key motor network in the brain that is active both when you perform an action, like moving your arm, and when you simply watch someone else—like a virtual avatar—perform that same action. Dr. Liew hypothesizes that, for stroke patients who can’t move their arm, simply watching a virtual avatar that moves in response to their brain commands will activate the MNS and retrain damaged or neighboring motor regions of the brain to take over the role of motor performance. This should lead to improved motor function. For many people, the knowledge that there’s “intent before movement”—in that the brain has to “think” about moving before the body will do so, is news. We also contain a “body map” inside our heads that predicts our spacetime presence in the world (so we don’t bash into things all the time and know when something is wrong). Both of these brain-body elements face massive disruption after a stroke. The brain literally doesn’t know how to help the body move. What Dr. Liew’s VR platform has done is show patients how this causal link works and aid speedier, and less frustrating, recovery in real life. She got the idea while geeking out in Northern California one day. “I went to the Experiential Technology Conference in San Francisco in 2015, and saw demos of intersections of neuroscience and technology, including EEG-based experiments, wearables, and so on. I could see the potential to help our clinical population by building a sensory-visual motor contingency between your own body and an avatar that you’re told is ‘you,’ which provides rewarding sensory feedback to reestablish brain-body signals. “Inside VR you start to map the two together, it’s astonishing. It becomes an automatic process. We have seen that people who have had a stroke are able to ’embody’ an avatar that does move, even though their own body, right now, cannot,” she says. Dr. Liew’s system is somewhat hacked together, in the best possible Maker Movement style; she built what didn’t exist and modified what did to her requirements. “We wanted to keep costs low and build a working device that patients could actually afford to buy. We use Oculus for the [head-mounted display]. Then, while most EEG systems are $10,000 or more, we used an OpenBCI system to build our own, with EMG, for under $1,000. “We needed an EEG cap, but most EEG manufacturers wanted to charge us $200 or more. So, we decided to hack the rest of the system together, ordering a swim cap from Amazon, taking a mallet and bashing holes in it to match up where the 12 positions on the head electrodes needed to be placed (within the 10-10 international EEG system). We also 3D print the EEG clips and IMU holders here at the lab. Going forward, Dr. Liew would like to bring her research to a wider audience. “I feel the future of brain-computer interfaces splits into adaptive, as with implanted electrodes, and rehabilitative, which is what we work on. What we hope to do with REINVENT is allow patients to use our system to re-train their neural pathways, [so they] eventually won’t need it, as they’ll have recovered. If you’re in L.A., Dr. Liew and her team will be participating in the Creating Reality VR Hackathon from March 12-15 at USC. Details here. Background. Individuals with stroke usually show reduced muscle activities of the paretic leg and asymmetrical gait pattern during walking. Objective. To determine whether applying a resistance force to the nonparetic leg would enhance the muscle activities of the paretic leg and improve the symmetry of spatiotemporal gait parameters in individuals with poststroke hemiparesis. Methods. Fifteen individuals with chronic poststroke hemiparesis participated in this study. A controlled resistance force was applied to the nonparetic leg using a customized cable-driven robotic system while subjects walked on a treadmill. Subjects completed 2 test sections with the resistance force applied at different phases of gait (ie, early and late swing phases) and different magnitudes (10%, 20%, and 30% of maximum voluntary contraction [MVC] of nonparetic leg hip flexors). Electromyographic (EMG) activity of the muscles of the paretic leg and spatiotemporal gait parameters were collected. Results. Significant increases in integrated EMG of medial gastrocnemius, medial hamstrings, vastus medialis, and tibialis anterior of the paretic leg were observed when the resistance was applied during the early swing phase of the nonparetic leg, compared with baseline. Additionally, resistance with 30% of MVC induced the greatest level of muscle activity than that with 10% or 20% of MVC. The symmetry index of gait parameters also improved with resistance applied during the early swing phase. Conclusion. Applying a controlled resistance force to the nonparetic leg during early swing phase may induce forced use on the paretic leg and improve the spatiotemporal symmetry of gait in individuals with poststroke hemiparesis. Post-stroke weakness on the more-affected side may arise from reduced corticospinal drive, disuse muscle atrophy, spasticity, and abnormal co-ordination. This study investigated changes in muscle activation patterns to understand therapy-induced improvements in motor-function in chronic stroke compared to clinical assessments, and to identify the effect of motor-function level on muscle activation changes. Electromyography (EMG) was recorded from 5 upper-limb muscles on the more-affected side of 24 patients during early- and late-therapy sessions of an intensive 14-day program of Wii-based Movement Therapy, and for a subset of 13 patients at 6-month follow-up. Patients were classified according to residual voluntary motor capacity with low, moderate or high motor-function. The area under the curve was calculated from EMG amplitude and movement duration. Clinical assessments of upper-limb motor-function pre- and post-therapy included the Wolf Motor Function Test, Fugl-Meyer Assessment and Motor Activity Log Quality of Movement scale. Clinical assessments improved over time (p<0.01) with an effect of motor-function level (p<0.001). The pattern of EMG change by late-therapy was complex and variable, with differences between patients with low compared to moderate or high motor-function. The area under the curve (p=0.028) and peak amplitude (p=0.043) during Wii-tennis backhand increased for patients with low motor-function whereas EMG decreased for patients with moderate and high motor-function. The reductions included: movement duration during Wii-golf (p=0.048, moderate; p=0.026, high), and Wii-tennis backhand (p=0.046, moderate; p=0.023, high) and forehand (p=0.009, high); and the area under the curve during Wii-golf (p=0.018, moderate) and Wii-baseball (p=0.036, moderate). For the pooled data over time there was an effect of motor-function (p=0.016) and an interaction between time and motor-function (p=0.009) for Wii-golf movement duration. Wii-baseball movement duration decreased as a function of time (p=0.022). There was an effect on Wii-tennis forehand duration for time (p=0.002) and interaction of time and motor-function (p=0.005); and an effect of motor-function level on the area under the curve (p=0.034) for Wii-golf. This study demonstrated different patterns of EMG changes according to residual voluntary motor-function levels despite heterogeneity within each level that was not evident following clinical assessments alone. Thus, rehabilitation efficacy might be underestimated by analyses of pooled data.